Raise The Age North Carolina — What is Raise the Age? In 2019, North Carolina will finally raise the age, 100 years after creating the juvenile code that defined 16- and 17-year-olds as adults. 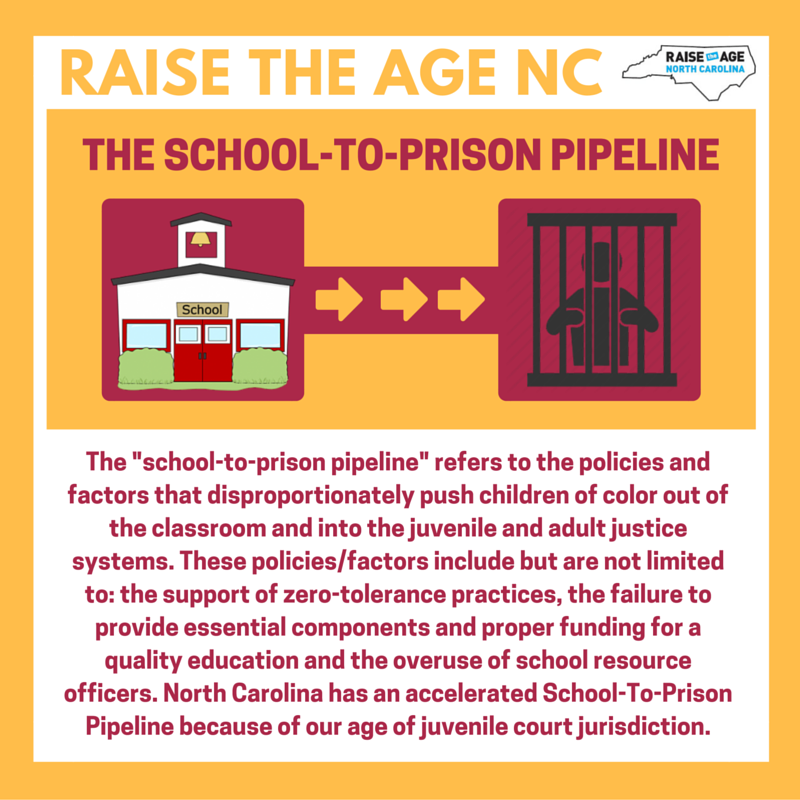 The Raise the Age NC Coalition supports the recommendation of Chief Justice Mark Martin’s Commission on the Administration of Law and Justice to automatically raise the age to 18 for low-level felonies and misdemeanors (excluding Class A through E felonies and traffic offenses). There is ample evidence that raising the age could save North Carolina millions of dollars over time. Dramatic reductions in juvenile crime over the last decade have already led to long-term savings of more than $40 million a year. And the experiences of other states have found that raising the age is cost-effective. One Wisconsin study found "for every 1,000 youth returned to the juvenile system there will be $5.8 million in direct savings each year through reduced law enforcement costs, court costs, and losses to victims." 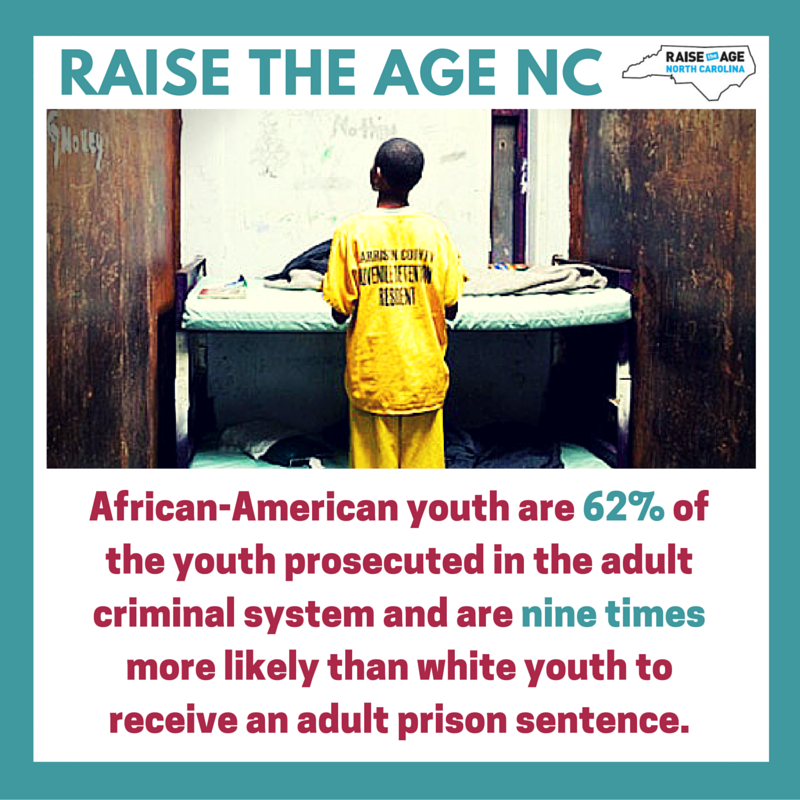 By reducing recidivism and improving outcomes for youth, raising the age will strengthen North Carolina’s tax base and reduce future expenses. Recidivism rates for 16- and 17- year olds handled by the adult criminal justice system are more than twice as high as those served by the juvenile justice system. The juvenile justice system is not a “get out of jail free” card. All crimes—especially when committed by youth—are a serious matter. The fact is: the juvenile justice system is better equipped to rehabilitate youth and encourage families to be engaged in the process as well. Two-thirds of children in the criminal justice system have at least one disability. The juvenile justice system is a far more productive setting for these children than the adult criminal justice system, because it offers needed services and support that can help youth with disabilities stay on track in the future. The adolescent brain is still developing and responds well to interventions. With support, young people can learn to make responsible choices and are likely to grow out of negative or delinquent behavior.